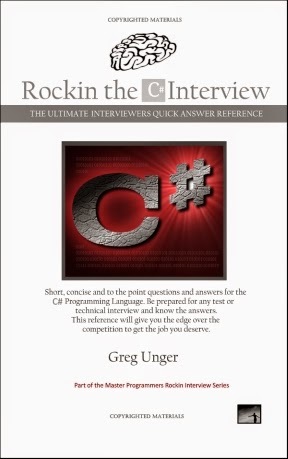 Rockin the Cloud Interview - PDF, Paperback, Kindle #Cloud #CloudComputing #Azure #Microsoft #CloudInterview: Rockin the Cloud Interview is a comprehensive short question and answer guide to helping you succeed in a Cloud Computing or Microsoft Azure technical interview or technical exam. This book is a MUST HAVE! A type defines the blueprint for a value. A value is a storage location denoted by a variable (if it can change) or a constant (if it cannot). All values in C# are an instance of a specific type. The meaning of a value, and the set of possible values a variable can have, is determined by its type. The Type class represents type declarations: class types, interface types, array types, value types, enumeration types, type parameters, generic type definitions, and open or closed constructed generic types. Type is the root of the System.Reflection functionality and is the primary way to access metadata. Use the members of Type to get information about a type declaration, about the members of a type (such as the constructors, methods, fields, properties, and events of a class), as well as the module and the assembly in which the class is deployed. No permissions are required for code to use reflection to get information about types and their members, regardless of their access levels. No permissions are required for code to use reflection to access public members, or other members whose access levels would make them visible during normal compilation. However, in order for your code to use reflection to access members that would normally be inaccessible, such as private or internal methods, or protected fields of a type your class does not inherit, your code must have ReflectionPermission. See Security Considerations for Reflection. Type is an abstract base class that allows multiple implementations. The system will always provide the derived class RuntimeType. In reflection, all classes beginning with the word Runtime are created only once per object in the system and support comparison operations. A contextual keyword is used to provide a specific meaning in the code, but it is not a reserved word in C#. Some keywords are contextual, meaning they can also be used as identifiers—without an @ symbol. add Defines a custom event accessor that is invoked when client code subscribes to the event. async Indicates that the modified method, lambda expression, or anonymous method is asynchronous. await Suspends an async method until an awaited task is completed. dynamic Defines a reference type that enables operations in which it occurs to bypass compile-time type checking. get Defines an accessor method for a property or an indexer. global Specifies the default global namespace, which is otherwise unnamed. partial Defines partial classes, structs, and interfaces throughout the same compilation unit. remove Defines a custom event accessor that is invoked when client code unsubscribes from the event. set Defines an accessor method for a property or an indexer. value Used to set accessors and to add or remove event handlers. var Enables the type of a variable declared at method scope to be determined by the compiler. where Adds constraints to a generic declaration. (See also where). yield Used in an iterator block to return a value to the enumerator object or to signal the end of iteration. With contextual keywords, ambiguity cannot arise within the context in which they are used. Do you know what Shared Access Signatures are? Using a shared access signature (SAS) is a powerful way to grant limited access to objects in your storage account to other clients, without having to expose your account key. In Part 1 of this tutorial on shared access signatures, we'll provide an overview of the SAS model and review SAS best practices. Part 2 of the tutorial walks you through the process of creating shared access signatures with the Blob service. What is a shared access signature? A shared access signature provides delegated access to resources in your storage account. This means that you can grant a client limited permissions to objects in your storage account for a specified period of time and with a specified set of permissions, without having to share your account access keys. The SAS is a URI that encompasses in its query parameters all of the information necessary for authenticated access to a storage resource. To access storage resources with the SAS, the client only needs to pass in the SAS to the appropriate constructor or method. When should you use a shared access signature? You can use a SAS when you want to provide access to resources in your storage account to a client that can't be trusted with the account key. Your storage account keys include both a primary and secondary key, both of which grant administrative access to your account and all of the resources in it. Exposing either of your account keys opens your account to the possibility of malicious or negligent use. Shared access signatures provide a safe alternative that allows other clients to read, write, and delete data in your storage account according to the permissions you've granted, and without need for the account key. 1. Clients upload and download data via a front-end proxy service, which performs authentication. This front-end proxy service has the advantage of allowing validation of business rules, but for large amounts of data or high-volume transactions, creating a service that can scale to match demand may be expensive or difficult. 2. A lightweight service authenticates the client as needed and then generates a SAS. Once the client receives the SAS, they can access storage account resources directly with the permissions defined by the SAS and for the interval allowed by the SAS. The SAS mitigates the need for routing all data through the front-end proxy service. Many real-world services may use a hybrid of these two approaches, depending on the scenario involved, with some data processed and validated via the front-end proxy while other data is saved and/or read directly using SAS. When you copy a blob to another blob that resides in a different storage account, you must use a SAS to authenticate the source blob. With version 2015-04-05, you can optionally use a SAS to authenticate the destination blob as well. When you copy a file to another file that resides in a different storage account, you must use a SAS to authenticate the source file. With version 2015-04-05, you can optionally use a SAS to authenticate the destination file as well. When you copy a blob to a file, or a file to a blob, you must use a SAS to authenticate the source object, even if the source and destination objects reside within the same storage account. Account SAS. The account SAS delegates access to resources in one or more of the storage services. All of the operations available via a service SAS are also available via an account SAS. Additionally, with the account SAS, you can delegate access to operations that apply to a given service, such as Get/Set Service Properties and Get Service Stats. You can also delegate access to read, write, and delete operations on blob containers, tables, queues, and file shares that are not permitted with a service SAS. See Constructing an Account SAS for in-depth information about about constructing the account SAS token. Service SAS. The service SAS delegates access to a resource in just one of the storage services: the Blob, Queue, Table, or File service. See Constructing a Service SAS and Service SAS Examples for in-depth information about constructing the service SAS token. A shared access signature is a URI that points to one or more storage resources and includes a token that contains a special set of query parameters. The token indicates how the resources may be accessed by the client. One of the query parameters, the signature, is constructed from the SAS parameters and signed with the account key. This signature is used by Azure Storage to authenticate the SAS. The account SAS and service SAS tokens include some common parameters, and also take a few parameters that that are different. Api version An optional parameter that specifies the storage service version to use to execute the request. Service version A required parameter that specifies the storage service version to use to authenticate the request. Start time. This is the time at which the SAS becomes valid. The start time for a shared access signature is optional; if omitted, the SAS is effective immediately. Expiry time. This is the time after which the SAS is no longer valid. Best practices recommend that you either specify an expiry time for a SAS, or associate it with a stored access policy (see more below). Permissions. The permissions specified on the SAS indicate what operations the client can perform against the storage resource using the SAS. Available permissions differ for an account SAS and a service SAS. IP. An optional parameter that specifies an IP address or a range of IP addresses outside of Azure (see the section Routing session configuration state for Express Route) from which to accept requests. Protocol. An optional parameter that specifies the protocol permitted for a request. Possible values are both HTTPS and HTTP (https,http), which is the default value, or HTTPS only (https). Note that HTTP only is not a permitted value. Signature. The signature is constructed from the other parameters specified as part token and then encrypted. It's used to authenticate the SAS. Service or services. An account SAS can delegate access to one or more of the storage services. For example, you can create an account SAS that delegates access to the Blob and File service. Or you can create a SAS that delegates access to all four services (Blob, Queue, Table, and File). Service-level APIs, which are called against the storage account resource. Examples includeGet/Set Service Properties, Get Service Stats, and List Containers/Queues/Tables/Shares. Container-level APIs, which are called against the container objects for each service: blob containers, queues, tables, and file shares. Examples include Create/Delete Container,Create/Delete Queue, Create/Delete Table, Create/Delete Share, and List Blobs/Files and Directories. Object-level APIs, which are called against blobs, queue messages, table entities, and files. For example, Put Blob, Query Entity, Get Messages, and Create File. Tables and ranges of table entities. From wikipedia: In computer programming, SOLID (Single responsibility, Open-closed, Liskov substitution, Interface segregation and Dependency inversion) is a mnemonic acronym introduced by Michael Feathers for the "first five principles" named by Robert C. Martin in the early 2000s that stands for five basic principles of object-oriented programming and design. The principles, when applied together, intend to make it more likely that a programmer will create a system that is easy to maintain and extend over time. The principles of SOLID are guidelines that can be applied while working on software to remove code smells by causing the programmer to refactor the software's source code until it is both legible and extensible. It is part of an overall strategy of agile and adaptive programming. O (OCP) - Open/closed principle states that software entities should be open for extension, but closed for modification. I (ISP) - Interface segregation principle states that many client-specific interfaces are better than one general-purpose interface. D (DIP) - Dependency inversion states that we depend upon abstractions not concretions. You will find that many higher level jobs, specifically jobs for domain, data or enterprise level architecture will require you know what SOLID is and abide by its principles. 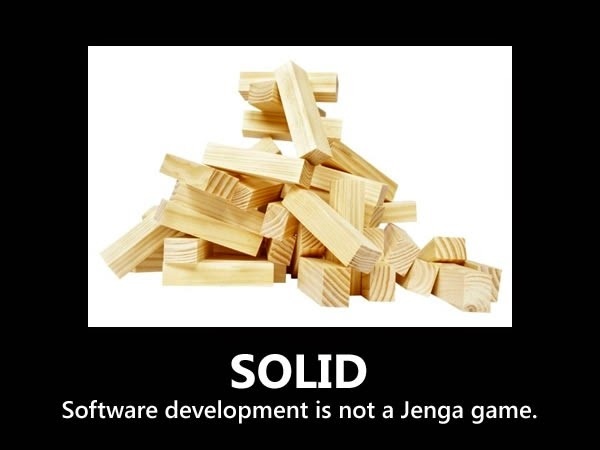 As you will see, SOLID is fairly straight-forward, however if you find that you don't understand any of the principles stated here, SOLID principles hedges against anti-patterns as well as problems with application coupling, rigidity and fragility. I urge you to do further research so you understand these principles. They are basic and fundamental principles that any good program would know.